Christmas is so close, I can taste it! You might not have time to sit RIGHT down and create, but be sure to pin these ideas and give yourself permission to create sometime very soon! Below you'll find Sketch 260. Create cards, scrapbook layouts, home decor, treat containers, mixed media, etc. using this week's sketch and be sure to link your project below for a chance at the weekly My Favorite Things Gift Voucher worth up to $20. 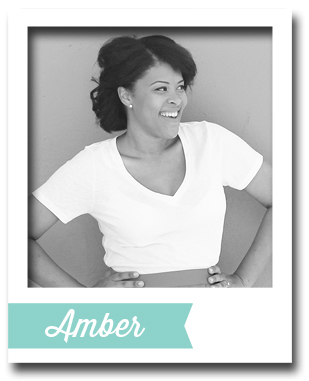 Amber Kemp-Gerstel is a jolly gal, and we're so glad she's spending Christmas week with us at the MFT Challenge and Inspiration blog as our December Guest Designer! There's basically not one social media channel Amber hasn't embraced. If you want to continue seeing pictures of her colorful creative life live from Miami, be sure to follow Amber on Instagram. This girl is bold and vibrant and an absolute joy to watch! And if you like babies, her Markus is one little cutie-patootie, that's for darn sure! Amber has a knack with simplicity, and this card is no exception. She substitutes stars for the circles of the sketch and anchors her sentiment on a colorful banner. Perfection! The Challenge Team is at it again with inspiring creations. Let's see how they interpreted Sketch 260! 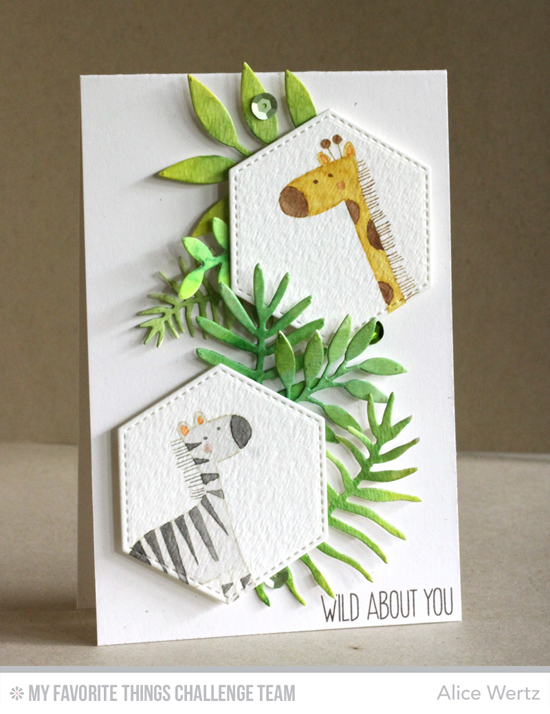 Alice changes the circles to hexagons using the Stitched Hexagon STAX Die-namics where she features two adorable creatures from the Sweet Safari stamp set. 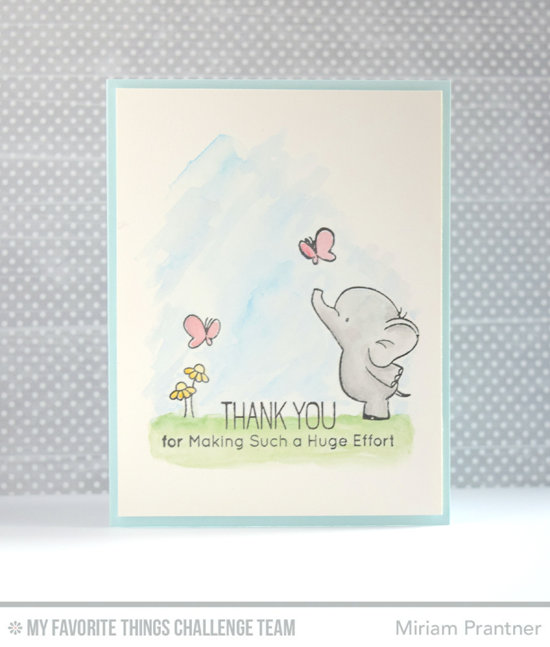 The Leafy Greenery Die-namics is just the right finishing touch to this cute design! Like Amber, Erin Lee is seeing stars in this sketch! 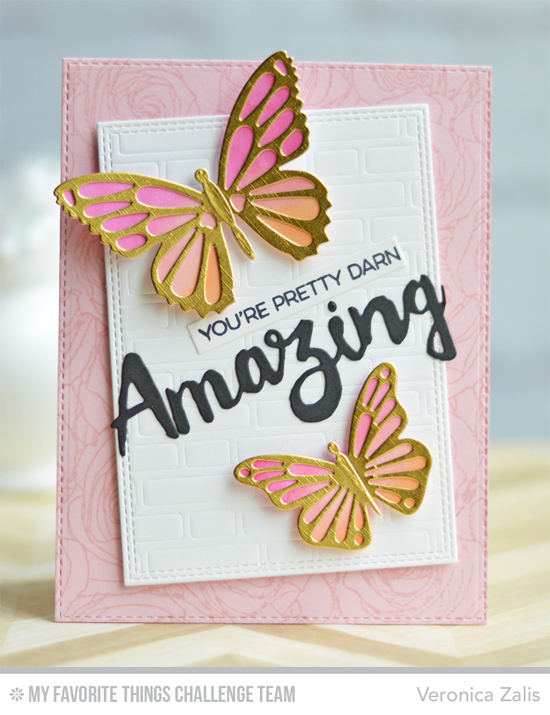 Add in bold colors with the Distressed Patterns stamp set and an eye-catching sentiment from the Amazing stamp set and BAM! Jill places colorful pinwheels in lieu of the circles. And it's pretty cool how she did it! 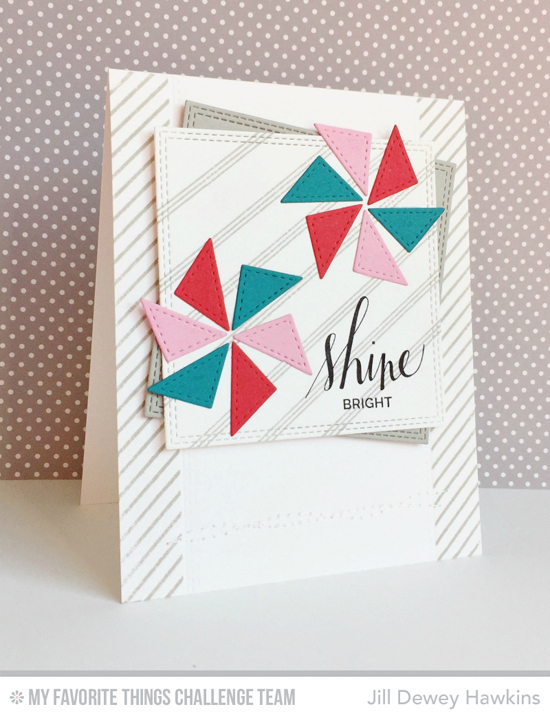 The card stock triangles are the negative pieces from the Diagonal Quilt Square Cover-Up Die-namics. An inventive way to use your dies in different ways! 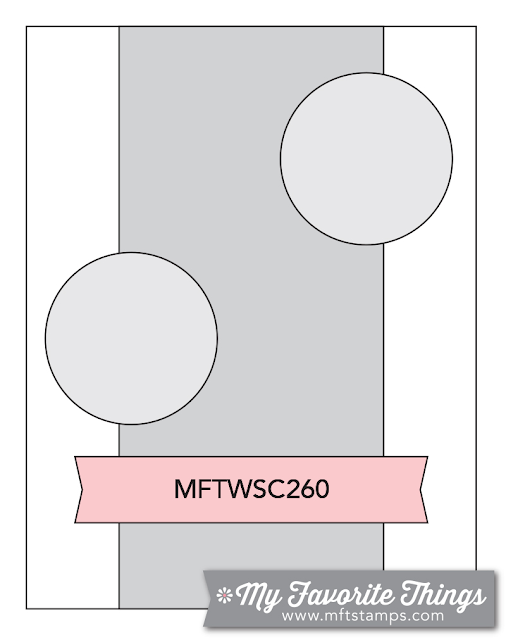 Miriam minimizes the sketch to only the lower half of the card giving the design plenty of white space. 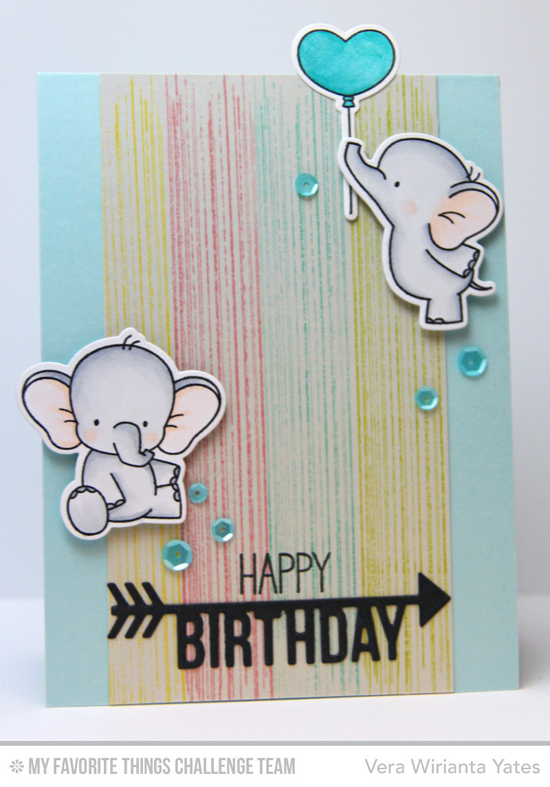 The tiny butterflies from the Adorable Elephant stamp set mimic the circles of the sketch on a much smaller scale. Vera also uses the elephants from the Adorable Elephants stamp set, but her two floating cuties take the main stage in her design. I love how the balloon rises above the top fold of the card. 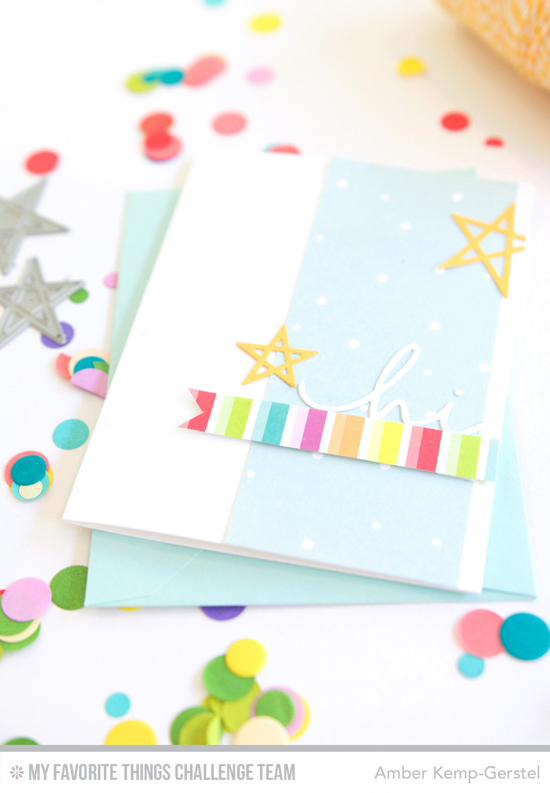 Tip: Use a larger envelope when your card has parts that stick out on the top or sides. Veronica's version of the sketch tilts to the left which led her to switch up the positioning of her stunning butterflies. The Brick Wall Cover-Up Die-namics and the Roses All Over background add delicious layers to her feminine design, and the strong sentiment fits the size of the butterflies for an excellent sense of balance. Congratulations, Lin Brandyberry! You are the randomly selected winner of last week’s sketch challenge. You can view all the entries for last week’s challenge HERE. You have until Tuesday, December 29th, at noon EST to add your link and be eligible for the prize of up to $20 in MFT Cash to be spent in the MFT boutique. Winners are chosen at random, so everyone has a chance! The weekly prize is a $15 Gift Voucher to My Favorite Things, but if you use MFT stamps and/or dies in your project, you’ll receive an extra $5. LOVE all of these, well done, ladies!! !